This AUD 358SD Home Theater Sound System has other features like Radio Antenna, Video Out, Audio In, Mic - Mic In, USB 2.0. It has a stylish design that will complement your home decor. It has a stylish design that will complement your home decor. This will be a great addition to your home entertainment system. It has been integrated with advanced technology which ensures outstanding sounds at all times. It has a DVD player as part of its setup so you can watch a wide range of movies on your television. LG is known for delivering the best entertainment systems and the LG Home Theatre 358 is no different. Its compact and portable design means it will fit into any space conveniently. 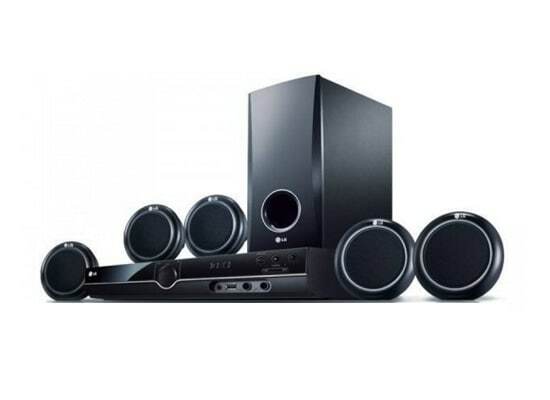 The LG Home Theatre 358 comes with five speakers that have a total power output of 300 watts. It has a USB port so you can play contents through it by connecting your external hard drive and USB drive. With this home theatre system in your home, the party never stops. Deep bass sound and clear audio quality is what you get when listening to music through the LG Home Theatre 358. Additionally, it comes integrated with an FM radio so you can comfortably stay in tune with your favourite on-air programmes. Every home needs a high quality home theatre to get the most out of any television.